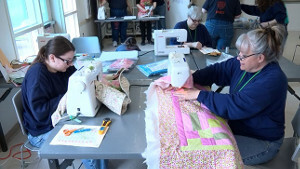 We’re excited to announce that Portland’s Channel 12 featured the Coffee Creek Quilters prison quilting program in it’s June 4th evening news broadcast. The segment gives viewers a glimpse into our classroom and an idea of how much the program means to our students. We invite you to watch.